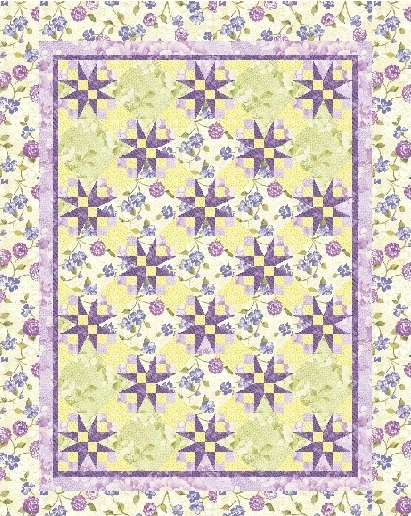 This entry was posted in Quilt Pattern, Quilting, Quilts & Projects: Published, Quilts: Pieced and tagged Benartex Perennials II by Eleanor Burns, Quilter's World April 2012, Spring Quilt, Star Quilt, Sweet Bouquets by Wendy Sheppard. Bookmark the permalink. Another WOW to you from me! Welcome back! So amazing. Thanks as always for sharing the back. You are an inspiration! Perfect for spring! 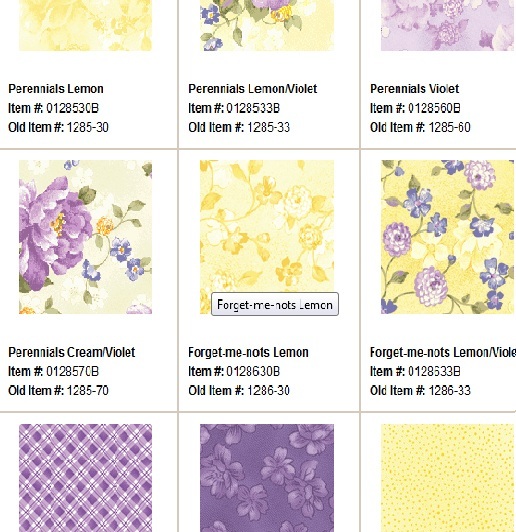 I have always loved the color combination of yellow and purple. 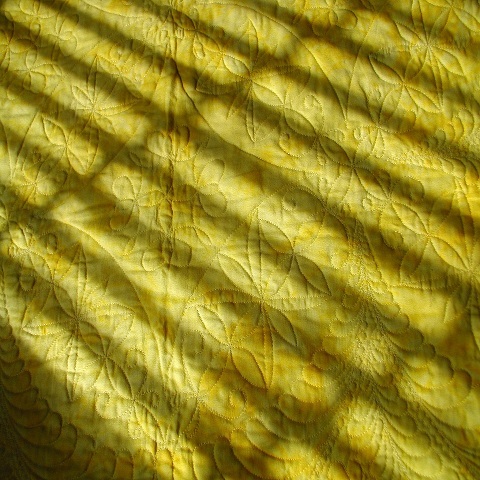 Beautiful quilt Wendy and I like the sunshine playing on it in some of the photographs! 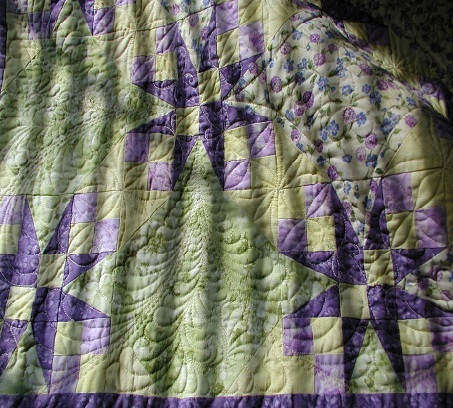 How beautiful and love the quilting! 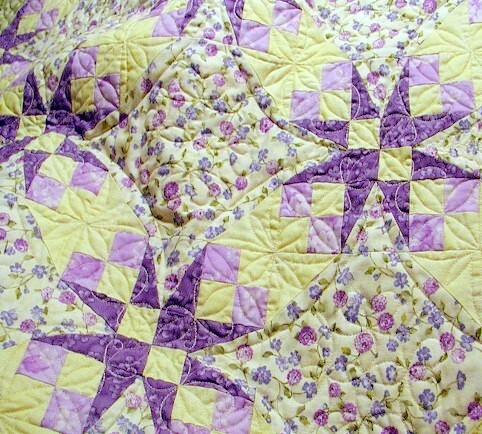 Another beauitful quilt. I don’t have much violet lavender in my home, but I have always wanted a room with lavender and blue together. One friend years ago had that combination in her home, her clothes, everywhere, lol! 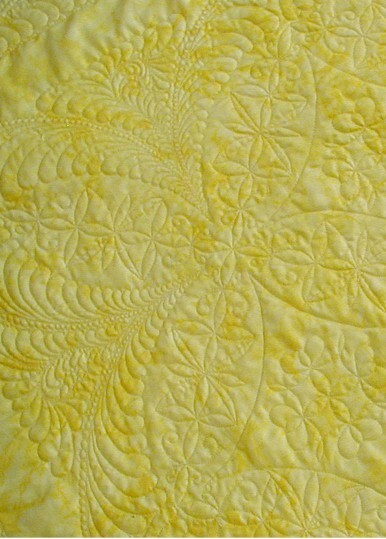 How do you quilt these gorgeous designs with perfection on a DSM all free hand and no marking. I have a difficult time just staying on the marked line of a simple heart shape. 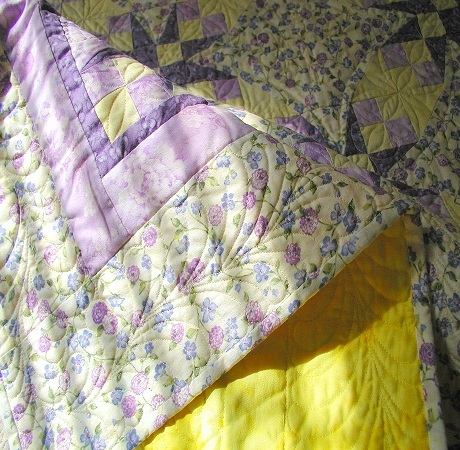 LOVE the quilt and the quilting. It’s very beautiful!! Simply stunning! I adore feathers, and you quilt them so well! 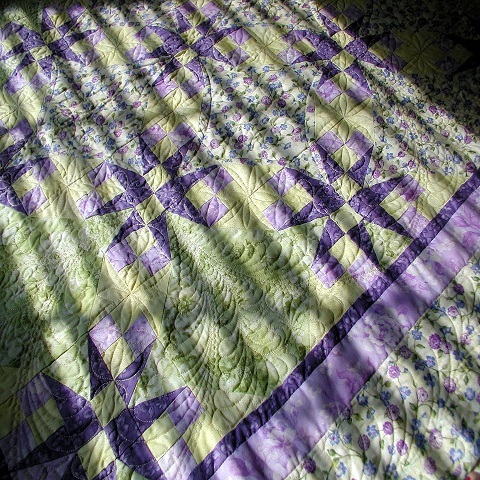 They always look beautiful on your quilts. Do you ever not quilt feathers? I’m FMQing a rather large quilt (85 X 95) and don’t want dense quilting. 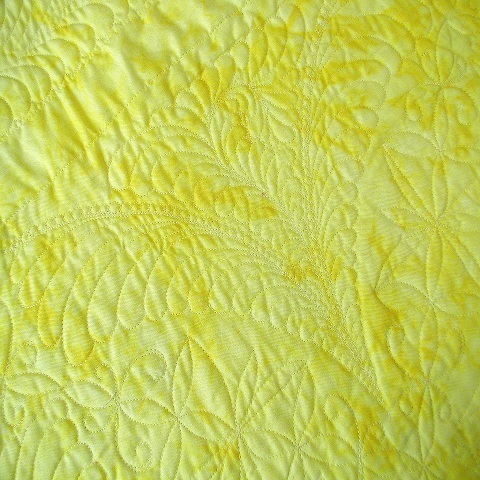 So, I’ve challenged myself to “keep it light” and “quilt without feathers.” Boy, is that ever challenging! I had no idea, until now, how often I turn to feathers for quilting. 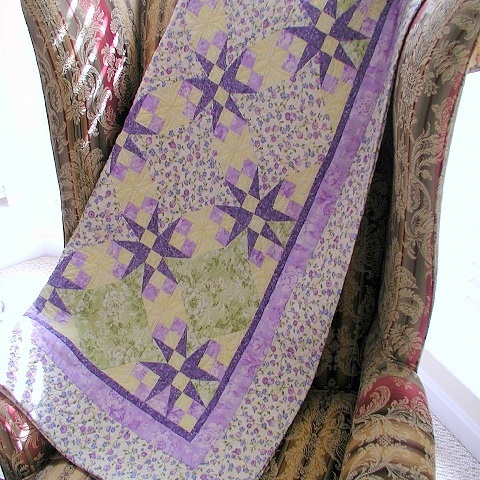 Oh Wendy that really is gorgeous – I love how the quilting looks on the back. You’re amazing! I have so many spring projects going in my mind it’s not funny, but only one being worked on, lol. Gorgeous!!! You are so talented!!! Oh my goodness!!! I’ve never seen such gorgeous feathers and on such alarge scale. Did you mark that motif? It is gorgeous!! Absolutely gorgeous! WOW!! I can’t wait to see what you’ll come up with next. 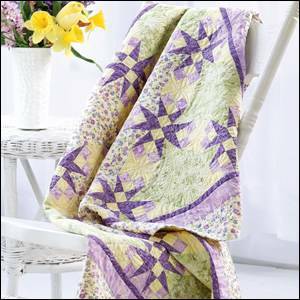 Your Morning Star quilt reminds me of Easter, the purple of Lent giving way to glorious sunshine and Easter lilies. 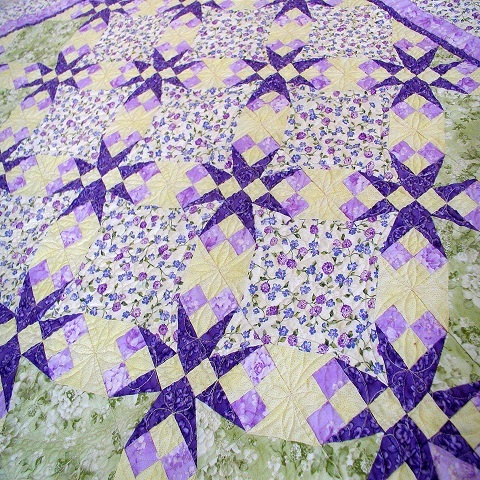 Another pretty quilt made fabulous w/outstanding quilting. I love the story behind it’s name. 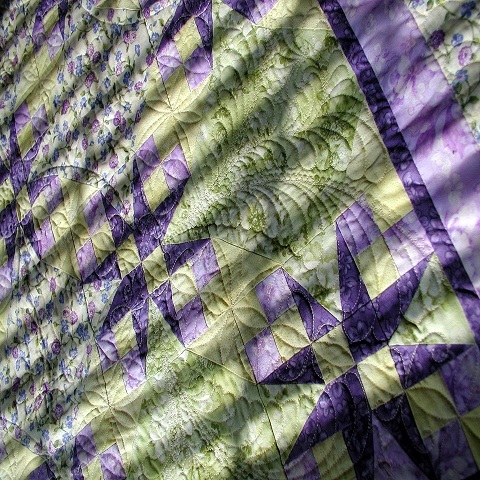 This is a gorgeous quilt. 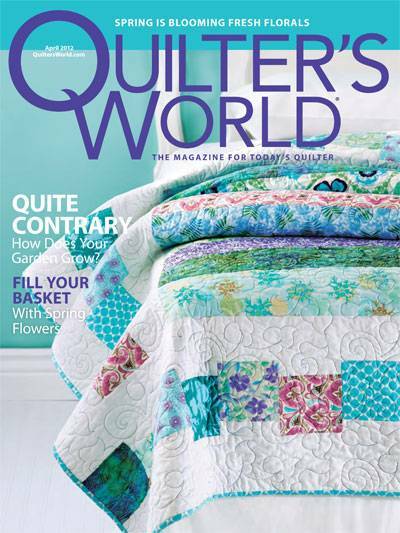 I love the quilting…brilliant! The backside does tell a totally different story than the pieced side. bareathtakingly beautiful! Love the colors and your thoughts. Beautiful quilt! I have the magazine and am sitting here trying to adjust this to a queen size. Could you possibly have this figured up already? I can do it but my brain hurts after a while! Thanks.